With the 2017 NAA Education Conference & Exposition just days away, it seemed like the perfect time to discuss a few of its marketing-related sessions and topics with #AptChat Nation. Q1: 1st marketing session up: “Fast Fixes for Slow Markets” w/ @kategood. Are you seeing a market slow down in your area? Q2: What are some of your favorite tips when it comes to persuading prospects to sign the lease? What are unethical tactics to avoid? 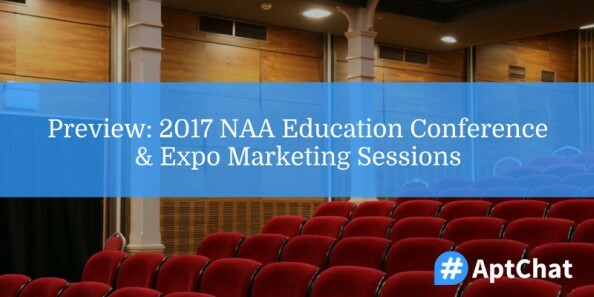 Q3: Lots of focus on data and technology as it applies to marketing and leasing this year at #NAAEdu17. Do you think the training is keeping up with marketing technology? What tech would you like to see more training on? 1st marketing session up: “Fast Fixes for Slow Markets” w/ @kategood. Are you seeing a market slow down in your area? Thank you!! I have a lot to share but now I’m going to get back to my Honeymoon! What are some of your favorite tips when it comes to persuading prospects to sign the lease? What are unethical tactics to avoid? #AptChat it’s all about the “team close” using the fellow office staff in a supportive method to get that interest! Lots of focus on data and technology as it applies to marketing and leasing this year at #NAAEdu17. Do you think the training is keeping up with marketing technology? What tech would you like to see more training on? Our next #AptChat is slated for Tuesday, June 13, 2017 at 12 pm Eastern, and we’ll be talking about Instagram and Snapchat for apartment marketing. In the meantime, be sure to sign up for #AptChat updates to get these recaps and more delivered straight to your inbox!